Abraham will be ineligible to play for Nigeria if he features in England upcoming friendlies against Germany and Brazil. 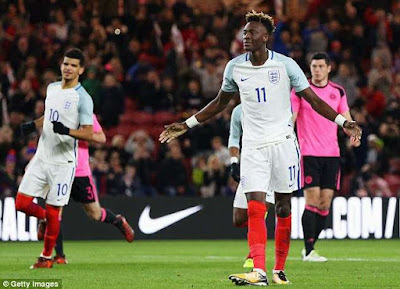 The Nigeria Football Federation (NFF) have lost out in their bid to get Nigerian-born British striker Tammy Abraham to play for the Super Eagles. The NFF tried to poach Tammy who is born to Nigerian parents for the Super Eagles but the Striker turned down the offer to make himself available for an England call-up. Abraham who plays for Swansea on loan from Chelsea has now been included in England’s squad for the upcoming friendly games against Brazil and Germany at Wembley. The striker has impressed this season at Swansea, scoring four goals in 10 games and England have now gotten ahead of Nigeria to secure the 20-year-old. Although England’s full squad for the friendly game has not been announced, the Football Association have already congratulated Abraham for the call-up via their Twitter account. The #ThreeLions squad for this month's games against Germany and Brazil will be revealed at 2pm. Congratulations to @J_Gomez97, @rubey_lcheek and @tammyabraham on their first #ThreeLions call-ups! England will be looking to fully secure the striker by playing him in the two friendly games which will make him ineligible for a switch. According to FIFA rule, a player cannot switch allegiance after playing in more than one friendly game for a country. The NFF thought they had convinced the striker to play for Nigeria after he met with the federation’s president Amaju Pinnick in September 2017. The NFF released a statement and photo after the meeting which suggested that the striker had agreed to switch allegiance to Nigeria. Abraham, however, released his own statement to deny NFF’s claims, making himself available for the England.